Welcome to the 200th edition of the Goodsol Newsletter. 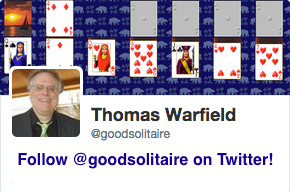 The Goodsol Newsletter has been regularly giving news about our solitaire games since 1997! An updated release of Pretty Good Solitaire (for Windows) is now available. Version 14.3.1 is available for download from http://www.goodsol.com/download.html . Version 14.3.1 contains a change to how a new sound in AutoPlay works. In version 14.3.0, a sound was added to AutoPlay moves in Windows 7/8 (this sound has always been there in Windows XP). The sound also has the effect of slowing down AutoPlay moves so that they can be seen better. This was as intended, as the sound and slower play was a feature that many people liked in Windows XP and complained because it was missing in Windows 7/8. Some users complained about the new sound slowing down play. Of course, in version 14.3.0 if you simply turn off sound the new sound does not play and AutoPlay speed returns to the same as in previous versions, but it appears a better solution was required. In the new version 14.3.1, the AutoPlay speed settings in Options now controls whether the new AutoPlay sound plays or not. If the AutoPlay speed setting is set to the highest (fastest) setting, the new AutoPlay sound will not play and the AutoPlay speed will be the same as in previous versions. If the AutoPlay speed setting is set to any setting below the fastest, the new sound will play. If you install version 14.3.1 and you want to hear the AutoPlay sound, you will probably need to click on the Options button on the main screen and turn the AutoPlay speed setting down a notch. Most people probably have this set on the fastest level. If you don't want to hear the sound, you will probably not have to do anything, as again it is probably already set to the fastest level. This change in 14.3.1 will hopefully provide a good solution for all those who liked the sound in Windows XP and missed it on their new computers and those who didn't like it when it was added for Windows 7 and 8 in version 14.3.0. If you have any comments or questions about the changes in the new version, you can email me at support@goodsol.com . You can download Pretty Good Solitaire version 14.3 from http://www.goodsol.com/download.html . Or, if you have a previous version installed, you can run the game, go to the Internet menu, and select "Download Latest Version". Be sure to exit the game before you install. Pretty Good Solitaire version 14.3.1 is a free update for those who originally ordered version 13 (ordered after April 12, 2011) or those who paid for an upgrade during that time. However, it is not a free upgrade for those who originally ordered version 12 or earlier. If you registration code begins with "43", "42", "2g", "2r", or "2a", version 14 is a free update. Otherwise, it is not. If your registration code starts with "27", "2p", or "2m", version 13 was a free upgrade but version 14 is not. If your code worked in version 14.0, 14.1, or 14.2, it will work in version 14.3. 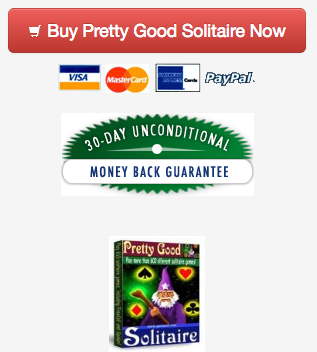 Pretty Good Solitaire version 14.3 is US$24.95 for immediate electronic delivery. If you want an additional CD, there is an option to add $9.95 shipping. In addition to installing the basic game, the CD also installs all of the currently available extra card sets. This game is at XV.